Okay. I know you’re probably looking at those little scallops on top of those noodles and thinking you’ve seen this before somewhere, tucked neatly in a memory folder stored in that one dusty corner of your cerebrum. And you have! 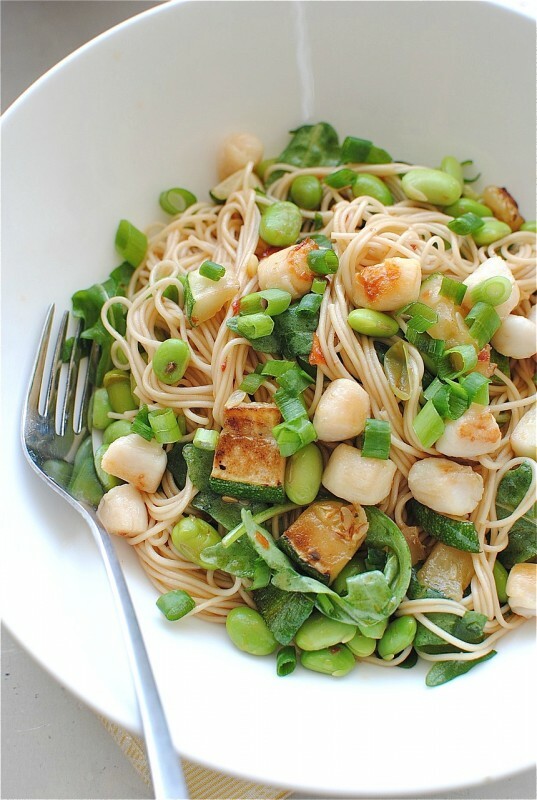 I kindasortamaybe made this back in April with soba noodles. But! I swapped out the veggies and fine-tuned her a smidge. 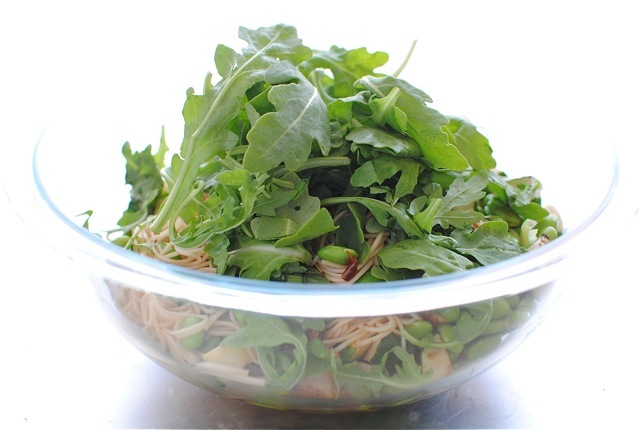 Plus, some of you may be new to my site and haven’t seen that old post on soba noodles. 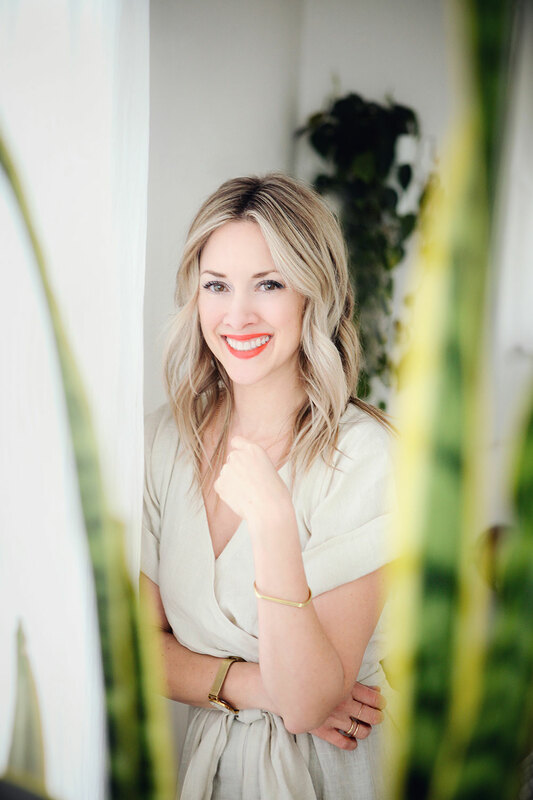 If you are new, I’d like to welcome you! Have you filled out these sign-in forms yet? So, Aaron and I are on this “low carb” thing right now (which is dumb) because we’re headed to North Carolina in a couple of weeks to sing in a family wedding, followed by a week on the beach with the whole crew and a bunch of swimsuits and cameras and SELF WORTH ON THE LINE. I say we’re on a low carb thing, which is a hilarious joke because A) I’m, uh, showing you somen NOODLES right this very second, and B) you’re going to shake your index finger right up in my face when you see what I’m posting next week. And then right after that you’ll love me forever and want to feed me niblets of dark chocolate whilst I lie on clean white linens kissed by the open summer breeze. My heart is in the right place though. And isn’t that what really counts here? No? Oh. 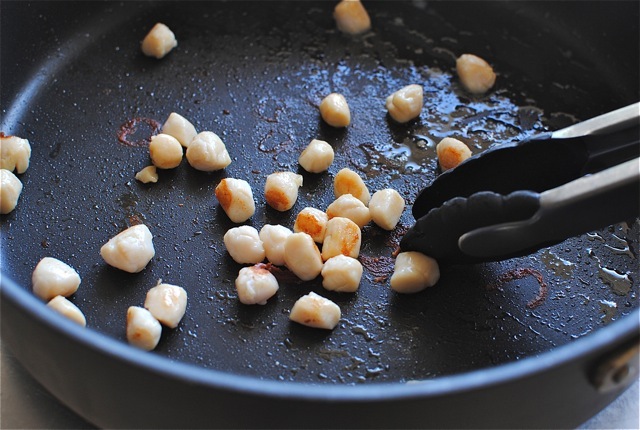 So remember that bag of little frozen baby scallops that I used last time? Finally used ’em up, bay-bay. Jeah. And sautéed zucchini from the garden, natch. 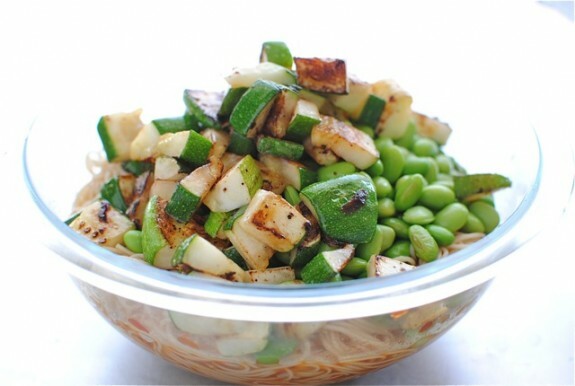 Somen noodles – ever had them? 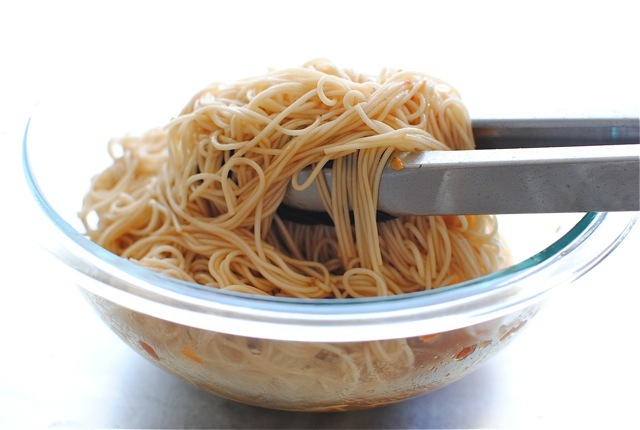 They’re super thin, delicate Japanese noodles that cook up in seriously half a nano. You buy them packaged in little bundles. “It’s time for a tumble with the bundle.” Name that movie. 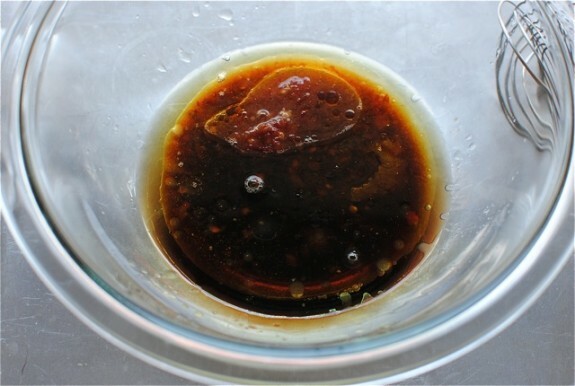 I like to drain them under cool water, wrap them around my neck like a million little scarves, and then toss them into this super primo, spicy, limey soy dressing that is most likely starting to replace my blood. And then when you toss in that cooked edamame, the zucc, some arugula, the bebe scallops, garnished with crisp, finely sliced scallions? And I mean really toss it good. Get everything coated with the dressing. And then scoot everything to one side and just slurp it right out of the bottom of the bowl like a true lady. 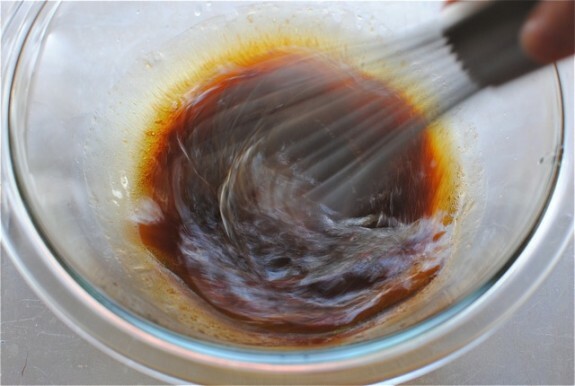 In a small bowl, whisk together 2 Tbs. oil, soy sauce, sambal oelek, brown sugar and lime juice. Set aside. 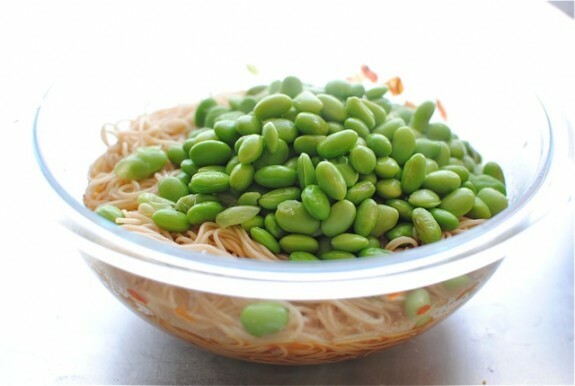 Cook the edamame in a small pot of boiling water for 5 minutes. Using a large slotted spoon, fish out the edamame, set aside and leave the water boiling. Add the somen noodles and cook until al dente, about 5 minutes, if that. Drain and rinse under cool water. 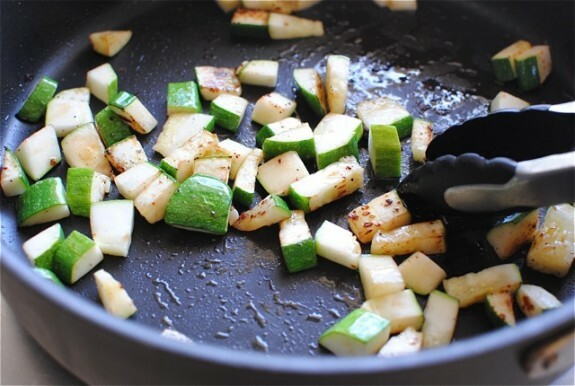 To the pan, add the diced zucchini and pinch of salt and sauté until they start to brown on both sides, 4 minutes. 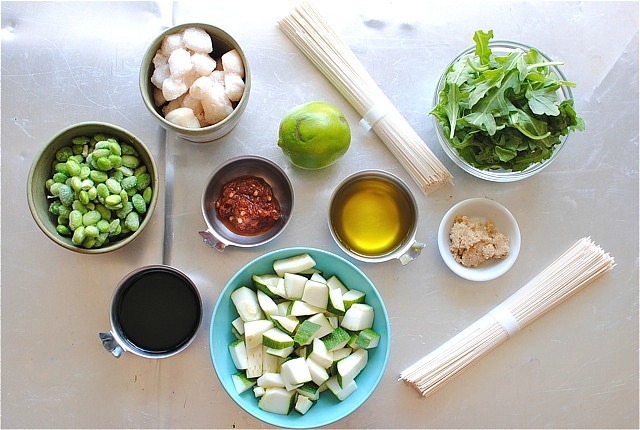 Add the somen noodles to the bowl with the soy dressing and toss to combine. 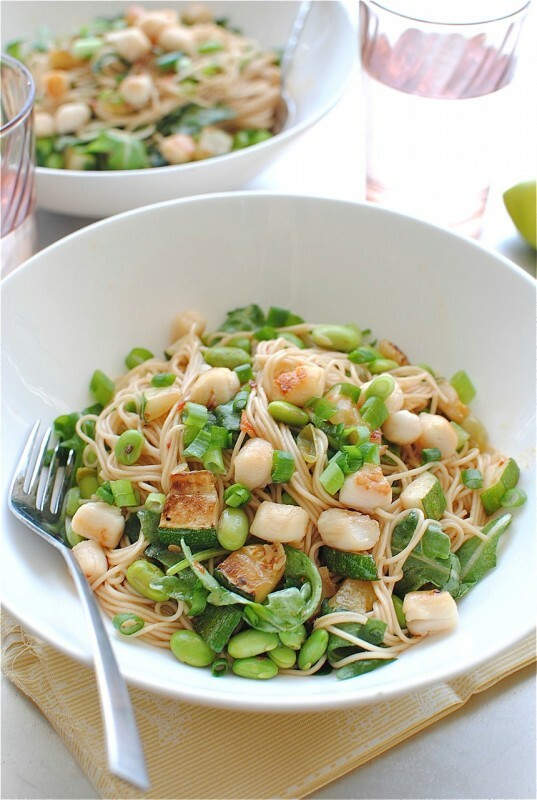 Add the edamame, zucchini, arugula and scallops; toss to combine. 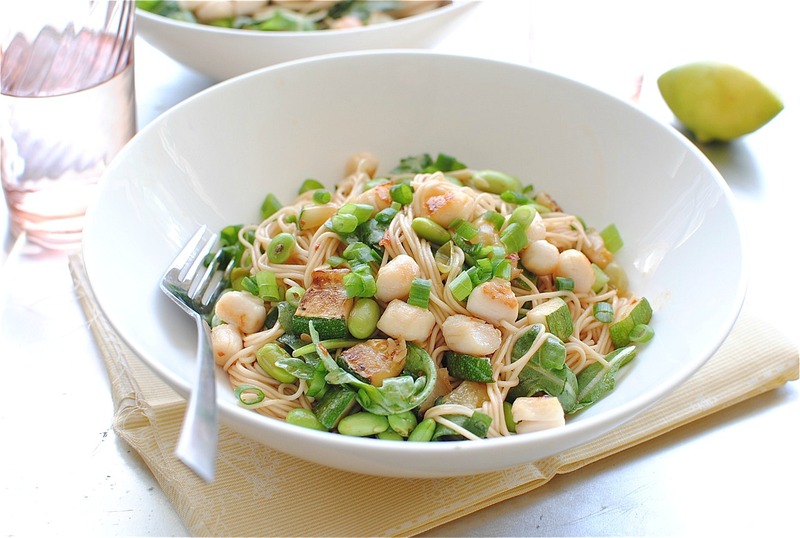 Divide the noodle dish among two dinner bowls and garnish with sliced scallions. 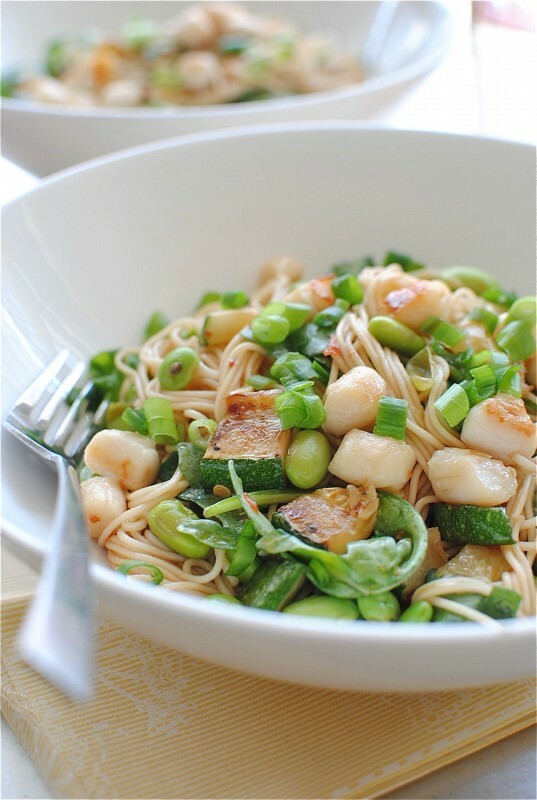 Serve with more fresh lime juice because ohhhh the things that will happen to you. Low carb never sounded and looked so good. This totally needs to be my lunch. So bright & fresh & pretty! Girlfriend we are doing a low carb thing too right now...someone just put me out my misery already! I didn't know that you sing! I love to sing....not sure anyone else appreciates my singing however. And the noodles, I just love noodles, please don't ask me to do the Low-carb, No-carb thing. Ever. So much green stuff. Lovin' it! I die. That is all. You're low carb approach is right up my ally. Low carbs, low schmarbs! Whatevs. This looks freaking fantastic! Ooooh, girl these look DELISH! Love all of the green!!! First off, the first recipe like this that you posted was fabulous. I have literally probably made it eight times since I first tried it, which was probably not even two months ago. So this will certainly be put into my recipe repertoire ASAP. Can you share my excitement with me just for a moment, that I knew how to spell repertoire? God, I used to be dreaming about these 2 or 3 days back. Will likely be trying it out! Sorry, I know this post is years old but nobody got the Annie reference!!! I'm a huge Annie fan ? Anyway, this looks delicious and I plan on trying it soon. Thanks!